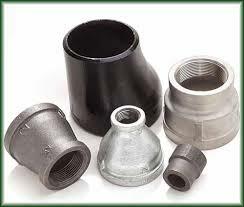 A reducer (or an expander) is a pipe fitting used to join to pipes of different sizes. If the upstream pipe is larger, then the tapering pipe leading to the smaller downstream pipe is called a reducer. Because, in this case the flow goes to a reduced passage. When the upstream pipe is smaller, the tapering pipe is called an expander. As in this case the flow goes to an expanded pipe. 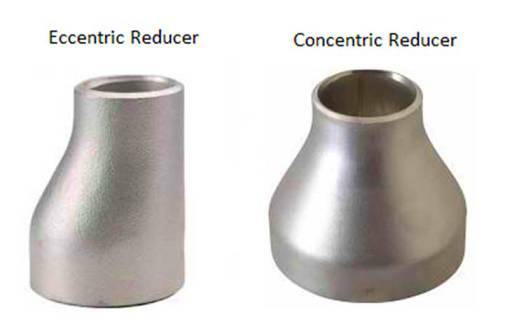 There are only 2 main types of reducer / expander joints - concentric and eccentric. Their names are quite self explanatory. Concentric reducers are quite common and used very widely in process piping. But when you install concentric reducers horizontally, there is a possibility of creation of air or vapor pockets in the upper part. Reducers and expanders are used extensively in the inlet/outlet piping of pumps. In fact they are used for connecting many equipment to the process piping, since equipment nozzles are generally smaller. If you install a concentric reducer in the suction piping of a centrifugal pump, you run the risk of pump cavitation. For this reason, eccentric reducers are preferred over concentric ones in centrifugal pump suction piping. The design, manufacturing, installation and maintenance of different piping fittings is governed by ASME/ANSI standards. Standard dimensions for piping reducers and expanders as per ASME/ANSI standards are tabulated here. Instead, you can also use this calculator to quickly determine the standard reducer dimensions for a given size. Frictional pressure drop across a straight length of a pipe is generally calculated using the Darcy's equation. But pipe fittings add more disturbance in the fluid flow and cause additional frictional losses. We can account for these additional frictional losses by using the concept of K factor or K value for a reducer. This K factor or K value for a reducer is the indicator of the additional frictional head loss created. There are multiple ways of estimating the K factor for reducers, before you calculate the overall frictional pressure loss across a pipe run. If the K factor is directly multiplied by (ρv2/g), that directly gives the additional pressure drop across corresponding fittings. You can use the K factor discussed above to calculate the equivalent length of a reducer. You can then add this equivalent length to the straight run pipe length. Then use that total length in Darcy's equation or in this pipe pressure drop calculator to calculate the pressure loss across a piping system.